So that's how you press tiny cucumber rolls. 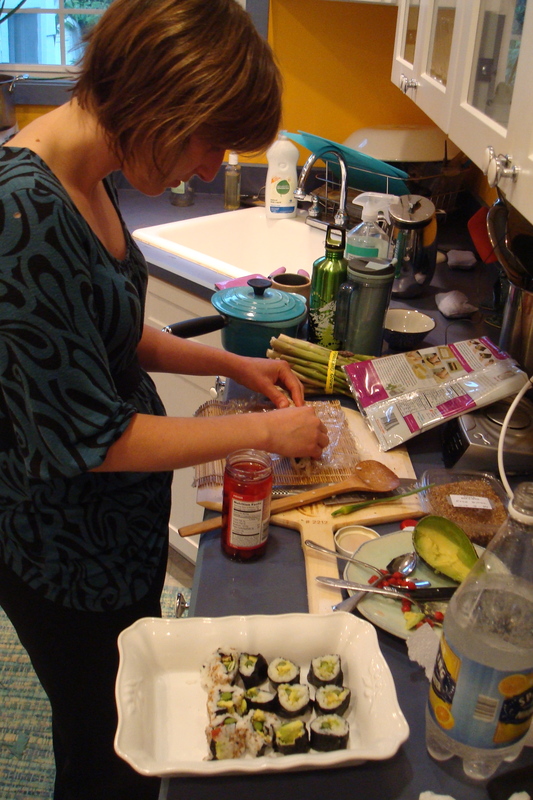 I love homemade sushi, but it’s somewhat of a pain to make with a bamboo roller. Tonight, we discovered an easier alternative. You simply mold the sticky rice into these wooden maki presses and then push down with a block to create the perfect well for your filling. Add some more rice on top, push the block through the frame, and voila! A perfect sushi rectangle. The nori easily wraps around the filling and sticks. 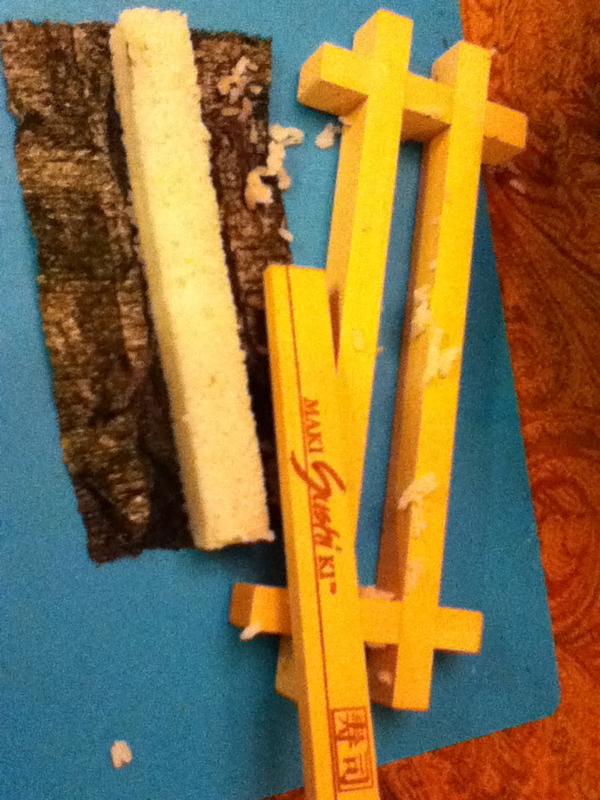 And it’s much faster and cleaner-cutting than the bamboo roller method. There’s a smaller press for cucumber-roll size rectangles–so that’s how they roll those perfect little squares. 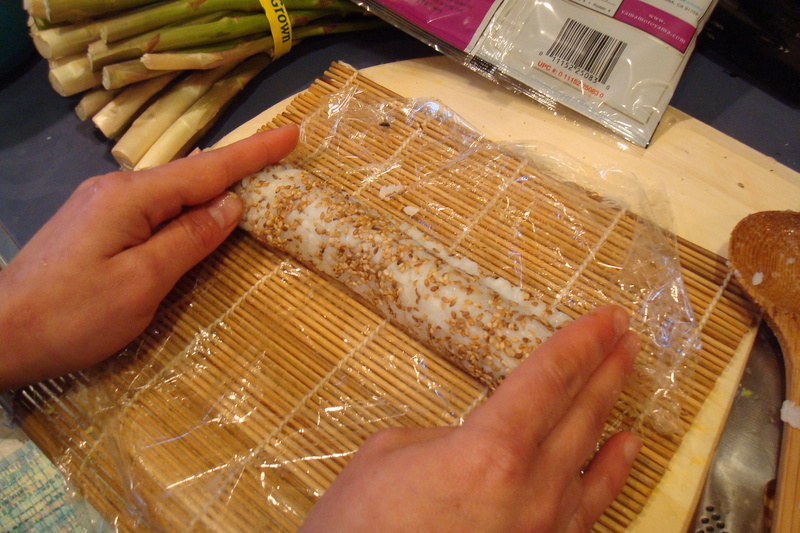 For inside-out rolls, you wrap the roll in cellophane and then use your bamboo roller. But this defeats the purpose of using nori to keep the sticky rice off your fingers. We also got learned how to make nigiri (open slab-style sushi) tonight. The teacher Sylvia Yamada said the trick is to first shape the sticky rice base to resemble a big garden slug:) Our Bangladeshi friend Christina held the event as a fundraiser for a Catholic Sisters of Charity school for very poor children (families live on $25 a month) in her hometown of North Laksmipur. It’s always nice to eat well for a good cause! Much easier than bamboo roller (still necessary with plastic wrap for inside-out roll). New method much easier than the bamboo roller.